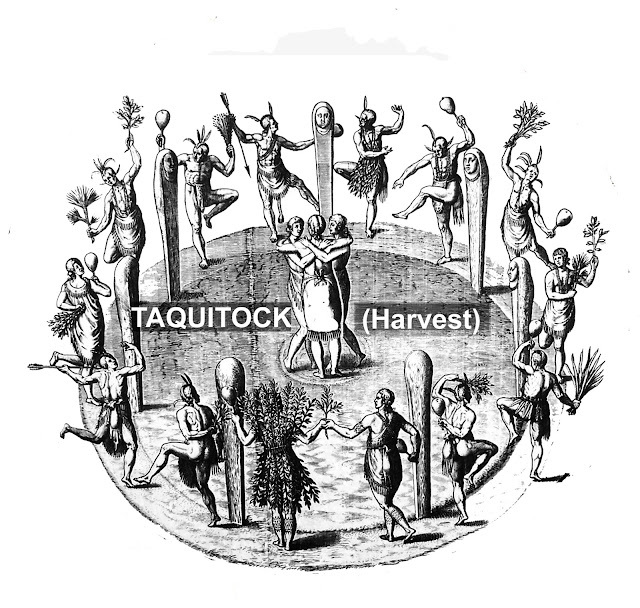 Taquitock (tah-qui-tock) , n. Algonquian, 1. The Harvest. The fourth of the five seasons of the year in which celebrations occurred. Thanksgiving, n, English, 1. The time set aside for showing appreciation. If on December 4th, you can’t find one of the above persons, thank an indigenous Bahamian, a Dominican, Haitian, Cuban, Puerto Rican, Jamaican, or Virgin Islander. Or thank an Amerindian Mexican, Virginian or New Englander. (Above) The typical image of the idealized “First Thanksgiving”. A 1914 painting by the English artist Jennie A. Brownscombe. Here the artist used one of the traditional painting and advertising compositional formulas in which figures of primary importance are made the largest and placed in the foreground; secondary figures are smaller and placed in the middle ground; figures of less importance are placed in the background. All figures, except the mother, bow or face towards the standing religious person. The artist’s depiction of a Madonna and Christ-like image of a child in a cradle in the foreground of the composition may portray the artist’s suggestion of a birth of a new nation. Also, notice the symbolism of subservience and religious overtones in the middle and backgrounds. The Indians at the table have Plains headdress not Wampanoag regalia. At the ending of National Native American Month, why should we thank an Indigenous American? Because their ancestors made America and Thanksgiving possible. It is also a form of adoration or showing gratitude. 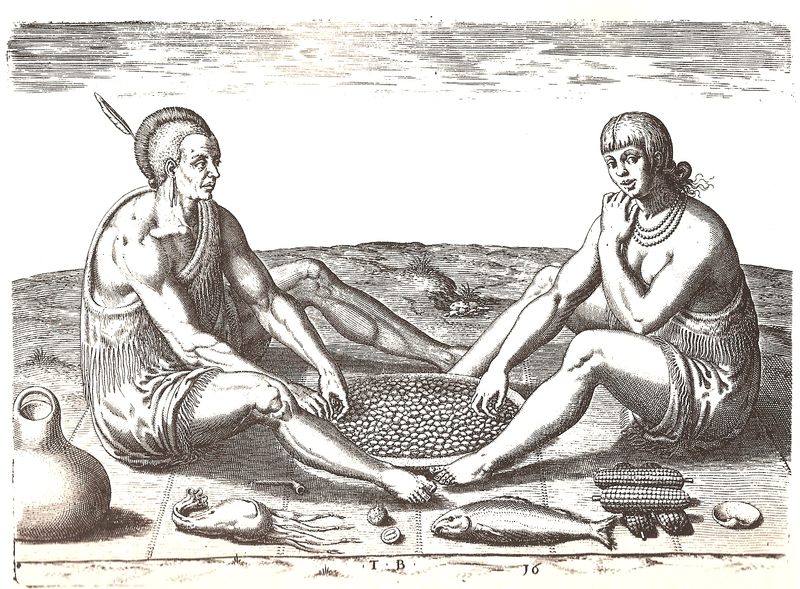 Why not thank one of the descendants of the First Americans to our south, the Taíno. They were the first to fall victim to Spanish and Portuguese commercial exploitation of their conucos (gardens). Have you ever wondered about the billions of dollars that many of the planet’s economies garner yearly from Amerindian agricultural products? Think latex rubber; corn/maize; potatoes (sweet and Inca); yucca/cassava; dried beans; peppers (capsicum); pineapples; tomatoes; etc., etc. China heads up the list of producers of corn in Asia. Corn/maize that we know today is a grain that Ancient Mexican horticulturalists “invented” to suit a variety of soils and climates. Many African countries continue to grow, export and feed millions with byproducts of plants that are endemic to the Tropical Americas. At the Thanksgiving dinner that we just celebrated, we ate Taíno gifts that were the first contributions of the 1492 Encounter. Their gardens added the pumpkin, peanuts, sweet potato, corn/maize, peppers, pineapple, and allspice to the menu. Our Thanksgiving menu also called for the domesticated Mexica (me-she-kah) or Mexican turkey and vanilla bean (ice cream) complemented by the Native American cranberry sauce. Since Columbus was searching for the Indian Subcontinent, we added nutmeg, cinnamon and cloves from that other part of Asia. This is November and the real Thanksgiving is not yet over! “The Pilgrims of Massachusetts ate the bones from the first Thanksgiving meal that was held in Virginia”. 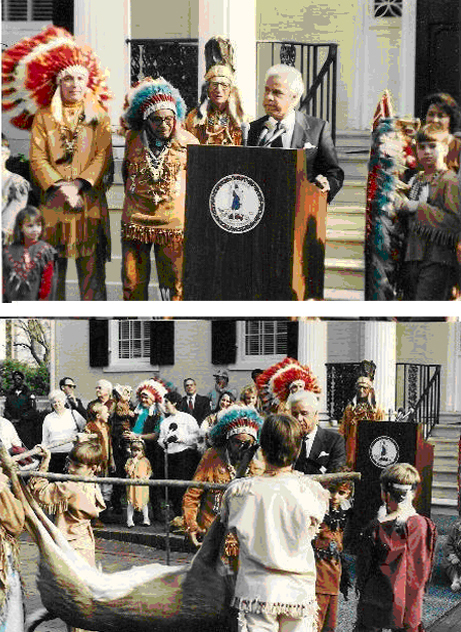 (R) Governor Douglas Wilder (who served from 2005 to 2009) in front of the Governor’s Mansion in Richmond, Virginia welcoming the chiefs of Virginia’s Pamunkey and Mattaponi Indian Reservations. He accepted the annual payment of deer as part of the annual treaty ceremony the week before Thanksgiving. The gift to the Colonial English governor was originally 20 beaver pelts. Governor Wilder was referring to the celebratory English who began arriving in 1607. Englishmen and women sat down at Berkley Plantation in Virginia’s Powhatan territory to have a Thanksgiving that predated New England’s Pilgrim arrival at Plymouth. The New England version was the third of this kind of celebration on American soil. The first American Thanksgiving (and maybe the second) at Berkley Hundred, a 8,000 acre property that later became Berkley Plantation, was held in the extensive Powhatan Chiefdom’s tri-state “tribal” territory (http://en.wikipedia.org/wiki/Berkeley_Hundred). At the plantation, Powhatan’s people may have provided the main dishes, since the English relied on Powhatan corn and game for survival. However, no enslaved Africans had yet graced the table since in that year only indentured Africans, confiscated from a Dutch ship, were to arrive in the new colony. Pictograph of the Pamunkey Treaty observance. Although the time when “the geese fly” may refer to Spring and not Fall. Undoubtedly, Native Americans had the earliest Thanksgivings in the United States. 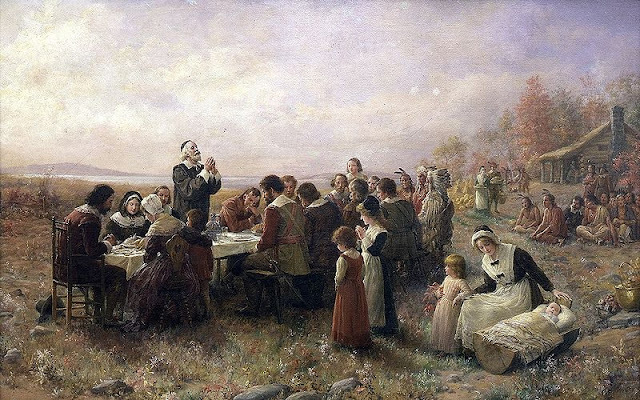 The first official colonial Thanksgiving was on 4 December 1619 at the Berkley Plantation in Charles City County, Virginia located between Richmond and Jamestown. The third, “more official” Thanksgiving was a food fest that is still promoted as “The event that some Americans commonly call the ‘First Thanksgiving’". It was celebrated by the Pilgrims after their first harvest in the New World in 1621. However, this may have occurred in July after another arrival of immigrants in 1623. “The event now commemorated in the United States at the end of November each year is more properly termed a "harvest festival". Another source stated that the original festival was probably held in early October 1621 and was celebrated by the 53 famine-surviving Pilgrims, along with the [sachem (leader)] Massasoit and 90 of his [Wampanoag] men.” The first New England Thanksgiving was not likely a religious event and was a feast that lasted three days and was a typical English method of thanksgiving after a battle or an important event. The confusion about the true thanksgiving is why we see Pilgrims at the Macy’s Day parade instead of 17th Century English “venture capitalists” waving at the gullible consumers in the crowd lining Park Avenue in New York City. As an advertising major, I secretly love to watch the televised fictitious commercial spectacle with cartoon characters, marching bands and Broadway previews. This year among the multitude of floats, flying balloons and marching feet, I saw one Oneida Indian Nation float with Native Americans standing on a large turtle or “Turtle Island” (their name for the United States) representing Mother Earth, on whose back stood the “Tree of Peace”. This *float represented the Native Americans who were actually the majority present (in the woods) at the truly first, first, first Thanksgivings. So, Thanksgiving Day has not yet really arrived. Why aren’t we taught these points in the history of the creation of America? Apparently, we prefer to delete that which is embarrassing. It seems that, in our education system, we have chosen to promote religious Pilgrims over America’s first capitalists. Building a myth on “religious freedom” soothes the conscience and puffs up the chest more than the reality of a country founded on a business proposition initiated by the Virginia Company of London. *To see the Oneida Indian float and article go to http://www.syracuse.com/news/index.ssf/2012/11/oneida_indian_nation_float_to.html. Taíno = one of the indigenous peoples of the Caribbean. The other is the Island Carib. Mexica (Me-she-kah) = Also called Aztec, a people of Mexico. Powhatan = The indigenous people of Tidewater Virginia whose territory included Jamestown and lay within present day North Carolina, Virginia, Maryland and Washington, DC.